As summer approaches, we all want to get in shape. It is the summer months that give us the most motivation. In the winter we seem to just want to eat and hibernate like forest animals. The reason summer is the most motivating is because it is the time of year when we don’t need to pile on layers of clothing, we strip off as much clothing as possible to show off our hard work and determination. Wearing a t-shirt or a vest with shorts is great, and a bonus when you have a good physically fit, toned body. It is where the guys will show off their defined muscles, and the ladies their elegant figure. These people who show off their bodies do not only workout in the summer months, they will be working out hard throughout the whole year. Working out is only one part of the equation, the other part is diet. No matter how much you work out, if you feed on KFC and McDonalds everyday, you will not lose weight! This is a fact. Your diet needs to consist of protein, carbohydrates and (good) fats. These three nutrients are essential, whatever your goal. 1.3 Will The Elliptical Cross Trainer Fit Nicely In Your Living Room? Cross trainers or otherwise known as elliptical trainers are an exercise machine designed to give you a very effective yet low impact workout. While it is a low impact exercise machine, you can certainly do high intensity interval training (HIIT) as well as low intensity steady state (LISS). If, like me, you have suffered injuries to the knee joints, feet or back you will find cannot run (or even walk uphill) without pain and discomfort. I struggled a lot when trying to get a good workout that didn’t impact my knee joints. The cross trainer was a sure saviour because it is low impact and it gave me the benefit of having a great high intensity workout without causing me any pain or further injury to my knee. When you work out on the cross trainer you will find your legs move in a smooth elliptical motion, no impact. Compare this with running, and you will see that running has a big impact on every step. While running is still a very good exercise for cardio, it is still high impact and if you have previous injuries to the joints or just simply want to prevent injuries then I would stick with the cross trainer every time. 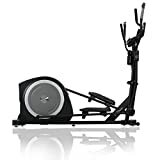 JTX Zenith: Elliptical Gym Cross Trainer. JTX Transition: Folding Gym Cross Trainer. FREE Polar Chest Strap. JTX Tri-Fit: Extendable Long Stride and Incline Cross Trainer. Since investing a cross trainer for my home, I do find I work out a lot more than when I just went to the gym. Going to the gym involves me putting my gym gear in the bag, then into the car, driving to the gym. This was more effort than it was worth to me, as most probably it will to you too. So I bought a cross trainer. Now I have no excuse. I schedule myself to work out twice a day on the cross trainer (and I go to the gym to swim and do my weight training). I work out first thing in the morning at 6am while watching the breakfast news on TV and then again after work at around 6pm while watching (don’t judge me); The Simpsons. When you are watching TV while working out, the time will go very quickly, it will not feel like you are working and you will get good satisfaction from it. I find myself actually looking forward to working out. Occasionally I will even workout listening to audiobooks, check out the great collection at Audible on Amazon. It doesn’t have to be fiction either, you can get some great self-improving audio books, which you can listen to while you work out enabling you to workout your body and expand your mind at the same time. Watching TV and listening to audiobooks while you work out is all well and good while you are doing LISS training, but for HIIT you will need more motivational listening. I find albums like this really help me push myself when I find myself struggling to go that extra mile or that last 200 calories. Will The Elliptical Cross Trainer Fit Nicely In Your Living Room? The chances are that you will not be looking to buy a commercial grade cross trainer that they have in gyms. These machines are very robust and are designed to withstand an awful lot of wear and tear. They are in constant use from people of all different kinds of weight, fitness level and stamina. The gym cross trainers typically cost around £6,000 – £10,000. Home cross trainers, depending on the manufacturer are still very well built and are robust. The major difference would be they are physically smaller and therefore will leave you with a smaller foot print than what a gym crosstrainer would. The build quality will not be as “industrial” as the gym cross trainers, but if its only a few of you using as opposed to a few hundred people, then it will not make a difference. Also as it is your cross trainer, you will look after it more than an average person would a gym cross trainer. With home cross trainers, you would usually get a few extra features than you would expect to find with the gym cross trainers. When buying a cross trainer for the home, measure the amount of space you have allocated for it – and always over-compensate – go around 10cm (4″) more than the space you have just as “breathing space”. You want to restrict your movement because you don’t have a lot of space around you. Consider the room you will be putting your cross trainer into, will it be a communal room where everyone comes to eat, drink, relax – if so, it may not be a good motivator for you to see people eating, drinking and relaxing while you’re trying to work out. If your cross trainer is going to be on one of the upper floors, then I would personally put it right above a wall / partition if possible as there will be much more strength there to stabalise the weight of you working out and the cross trainer. If you can avoid it, try not putting your cross trainer in the garage or the shed or anywhere it can get cold. If it gets cold, it can also warm up – this will cause condensation and moisture anywhere in the electrical areas of the cross trainer can and will damage it. This is one of the best features and any good quality cross trainer will have it. The cross trainer with this will use a varying magnetic field to cause the tension in your movement. Electric currents are passed through the electromagnets which creates the braking force. This gives you the ability to increase and decrease the resistance at the touch of a button. If on the other end of the scale, you had a resistance belt with a tension dial then you would need to manually adjust the intensity and this cannot be done while the cross trainer is in use. For most people, including myself, I personally like to work at a high intensity and have short low intensity intervals when doing my HIIT training and a cross trainer with electromagnetic resistance makes this possible and easy. As described above, the cheaper cross trainers will employ a belt and flywheel mechanism to control the tension in your workouts. If you do want to change the tension, then it would involve you stopping your workout and manually adjusting the tension. This can be bad as your body will begin to cool down in a short space of time. While many of today’s good quality cross trainers even come with a TV screen where you can watch TV while working out with your headphones plugged in or even an internet browser so you can check your email or watch videos on Youtube; I don’t think you need this. As long as your screen shows you your heart beat per minute, the calories you have burnt, distance you have travelled, your goal and the time elapsed – this is more than enough for your to get going. You just need enough information to motivate you and a goal to strive towards. The flywheel is what will give you a smooth and stable workout. The heavier the flywheel the better quality the cross trainer (generally speaking) and the more smooth a workout will be. These are sensors on the hand grips of the trainer. You simply hold on to the hand grips and make sure the your hand covers the sensors well and you will get your BPM reading on the display. As the name suggests, these are straps that will fasten on to your chest and measure your heart rate. These are usually more accurate than the hand pulse sensors. Most of the good quality cross trainers will come with pre-programmed workouts. Whether its fat burning, cardio, toning, interval or cross-fit; you will be not be bored with the options. Some cross trainers are smart enough to track your progress historically and then set realistic goals for you to meet. User profiles is a good feature if you are going to be sharing the cross trainer with other people. Because no two person has the same height, weight, fitness level etc. it is a good idea to create and save profiles for each user so you don’t have to set up each variable on the cross trainer every time you use it. The stride length is the length between your feet when you are moving. Shorter people will require a shorter stride length while taller people will require a longer one. This can usually be overcome as the foot plates can be long on certain models or even adjustable to you would stand on it where it suits you best. Some of the better, higher end models feature adjustable stride lengths. This is the idea scenario if you are planning to share the cross trainer with a taller or a shorter person. A bonus for me, but by no means essential. I like connecting my iPod or my iPhone when working out, but headphones are always a good alternative.